Trends such as cloud, mobile and the Internet of Things (IoT) are creating a deluge of data. Extracting the insight hidden within that data presents limitless potential for business transformation and innovation. Some business sectors are already well advanced on this journey. In the automotive industry vehicles are creating and receiving data to enable vehicle tracking, driver feedback, and a range of new real-time and personalized services; in healthcare, hospital infrastructure is orienting towards providing real-time information to patients and medical professionals, at the point of need. As the business develops new services and disruptive business models drawn from this potential, it’s up to the IT team to make it all possible. How will you pull together all this data, from multiple sources, to meet your colleagues’ expectations and deliver business value? 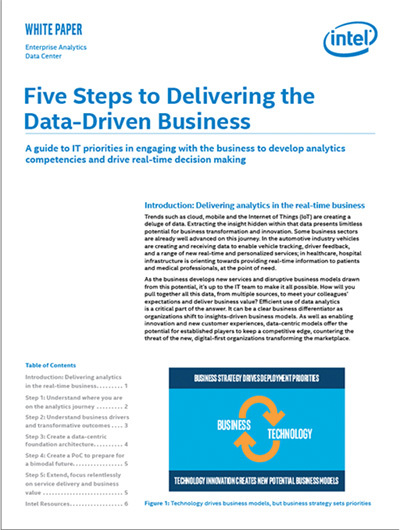 Efficient use of data analytics is a critical part of the answer. It can be a clear business diﬀerentiator as organizations shift to insights-driven business models. As well as enabling innovation and new customer experiences, data-centric models oﬀer the potential for established players to keep a competitive edge, countering the threat of the new, digital-frst organizations transforming the marketplace. This paper oﬀers steps to achieve this.